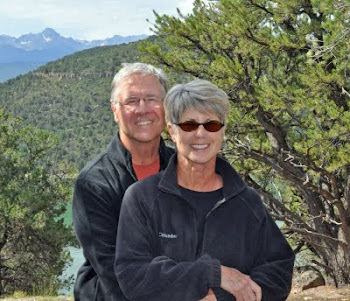 Find us on Google+ Rick and JoAnne's RV Travels: Who Knew? Ever hear of Lindsborg Kansas? Who knew? In the central plains of Kansas in what seems like the middle of nowhere we stumbled upon Lindsborg. The town, founded by Swedish immigrants in 1868 has maintained their cultural heritage. After lunch at the “charming” “The Butcher, the Baker and the Candlestick Maker” we spent a fun few hours walking the town looking at all the wonderful “public art”, shopping in the many craft and antique shops, and photographing the herd of wild Dala horses. What is a Dala horse you ask? It is a Swedish icon, a bluntly rounded, tail free horse originally whittled out of wood during long Scandinavian nights. Remember the Cows in Chicago? No cows for Lindsborg! The Dala horses are on every corner and in front of every shop – all individually decorated. Very cool! Our camp for the night was at Cheney State Park about 20 miles West of Wichita. Check out the Kansas Sunset! It is getting chilly here – time to head further South. We are a little further north in GlenElder KS and the sunset last night was incredible. May have to check out that Swedish village on the way south. Do check it out - as my wife says its "charming". We are heading back West for a few days to relive some of Route 66. Was so surprised to see you visited Lindsborg, Ks. That is where Ashley, my granddaughter, is in school at Bethany College. I was there recently for Homecoming and Family Week-end. She loves it!